Remembrance Day vs. Christmas Decorations: The battle begins. I was listening to talk radio as I drove home from wherever recently and there was a discussion about Christmas decorations, and the discussion was whether or not it is inappropriate (In Canada) to put up Christmas decorations prior to Remembrance Day (November 11th). One of the commentators said that Christmas decorations before Remembrance Day is disrespectful to veterans, and of course as these shows are set up (primarily on slow news days) the other host disagreed. The commentators hedged their bets, in case that topic had no interest, on whether it is appropriate for people who do not recognize the sacrifice of veterans to wear the poppy. 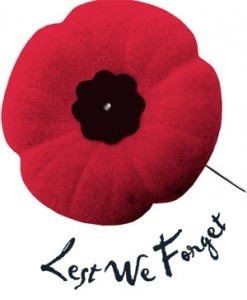 For those Americans who do not know, Canadians (and the entire British Empire as far as I know) wear poppies sold by the Legion (Our version of the VFW) to commemorate the veterans as well as the fallen. The symbol dates back to a poem by Lt. Col. Robert McCrae called In Flanders Field. For anyone who has ever worn a poppy from the Legion you will know that you would be hard-pressed to find a flimsier accoutrement, and as such it is common to see people who are not wearing it, simply because it has fallen off. I usually go through 5-6 of them in any given year. As such I do not think anyone would look at anyone and say ‘Oh, he or she is not wearing a poppy, he or she must hate Canada and our soldiers!’ The corollary to that is I doubt anyone has ever said ‘Oh look! That person is wearing a poppy, we can happily include them in all our reindeer games!’ It’s just silly. With that being said, every time you buy a new poppy – whether you support our troops or not – the money you put into the tin does go to help our veterans… and whatever your politics or beliefs, your money is just as needed. As for the first topic – the Christmas decorations – I strongly believe they should not go up before November 11th, but that has nothing to do with veterans or respect, rather the fact that, assuming the decorations do not come down until the second week of January, do we really need Christmas decorations in our face for 1/6th of the year – all of November and December? My ex-wife used to think I was anti-Christmas because I am Jewish, and that I did not want to have a Christmas tree in the house because I was some sort of Christmas Grinch. That is not the case… at least, not entirely. I think the vast majority of Christmas decorations that we see in this day and age are just gaudy and tasteless. I also don’t believe they need to be (or should be) out for two months of the year. I lived in Israel for four years and cannot remember seeing a Chanukah decoration even a week before the holiday started – nor three days after it ended. Assuming twelve days of Christmas, would it be so unreasonable to put decorations up December 15 (10 full days before the holiday starts) and take them down by January 15 (about a week after it ends)? That gives the people who love that ‘most wonderful time of the year’ an entire month – 1/12th of the year – to enjoy it, without either over-diluting the (ridiculously commercialized) message or making the rest of us overdose on it? As a veteran I have tried to figure out the connection between the two and I still cannot. I assure you that I am not offended by Christmas decorations on Remembrance Day… and if you want to wear a poppy because everyone else is then as long as you put your loonie into the tin then please by all means… but rather than looking at it from a ‘someone has to be offended’ standpoint, why not look at it as ‘MAYBE it’s just too much, and smaller doses can be a good thing!’ ?? And with that, shortly before midnight on November 3rd, I just heard my first Christmas Carol on the radio, and am going to go throw up. ← The Technology Life… From anywhere!